There is a beautiful fairy-tale villa that rises from the lush green fields of the Veneto. 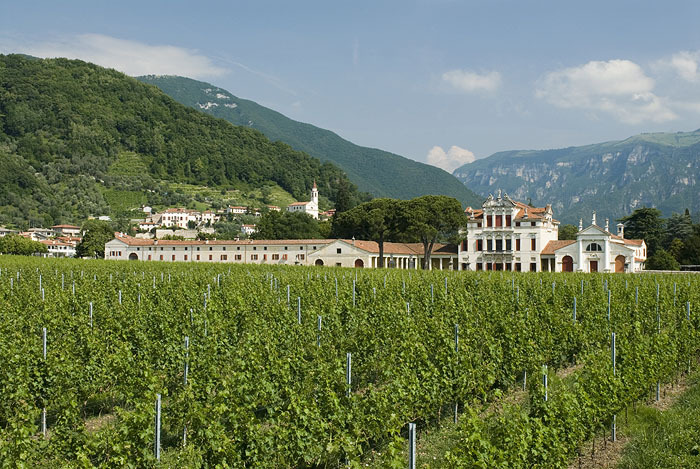 It is surrounded by vineyards and gently rolling hills that extend eventually into the Italian Alps. This elegant country house is about one hour’s drive north of Venice. It is the home of an excellent collection of wines. The wines are created with dedication and love. HISTORIC LEGACY – It is part of the legacy of beautiful villas designed by the architect Andrea Palladio in the 16th century. The classical facade of the grand building, it’s elegant symmetry and intricate carved pillars are compelling and intriguing. As you drive by you want to know who lives there, what do they do, what stories can they tell? Who built it and why? As a casual passer-by I cycled past the Villa Angarano in the 1980s. I was visiting some of the villas designed by the architect Andrea Palladio and I wanted to see if many were still occupied and how they had fared since their construction in the 17th and 18th centuries. I only got as far as the huge gates which were chained and padlocked shut in a very determined manner. I stopped in a nearby cafe and asked the owner about the house. ‘That’s the villa of the ladies’ he told me. For generations it has been passed down from mother to daughter, as part of her dowry. Today he continued, the house is still in the ownership of the Bianchi Michiel family and has been for more than three centuries. I cycled on that day in 1986 – my curiosity had been piqued. A few months ago I started to plan a road trip to Italy from England. I wanted to meet some interesting people on the way. Ideally I wanted to write about the characters I encountered and their lives. I’d recently written about Dame Freya Stark a pioneering female traveller and was in the mood to follow this up with more ‘capable woman’ stories. I suddenly remembered Villa Angarano – the villa of the ladies – and I wondered if there might be a story there. I contacted the office of the villa the very next day. To my amazement I received an almost immediate response. Ilaria the friendly ‘sales and marketing’ person was delighted to have heard from me. She told me that the Villa Angarano is now run by five sisters ‘cinque sorelle’ in Italian – of the Bianchi Michiel family and they’d be delighted to welcome me to the house. This was it I had my story. Fantastic. Several weeks later I was driving through the Italian countryside towards the hills, I was on my way to meet the Bianchi Michiel sisters. I felt nervous and excited all at the same time. My friend Sue had come along as the photographer. Sasha my loyal canine companion had come along to sample ‘abroad’. It’s not difficult finding a huge country house with commanding views over the surrounding vineyards. So even I couldn’t get lost. We crossed the blue-green waters of the River Brenta and headed north to the small hamlet of Sant’Esubio and the imposing Villa Angarano. We stopped for photos outside, partly to capture the moment but also to pluck up courage to find the entrance and actually knock at the door of this enormous country pile. I finally parked the car at the side of the house and walked into the courtyard, filled with farm implements and rusting cars. A young man was tinkering with an engine, I asked him where I should go. He pointed at a small archway in the far corner of the yard. I made my way hesitantly towards it. As soon as the door opened I was welcomed into the busy office like a long lost friend. I was introduced to Giovanna and Carla, two of the sisters and the charming Ilaria, with whom I had been in contact. The ladies are new to networking, marketing and self-promotion. They are both tall and slim, beautiful cheek bones, shiny, dark hair. They are both naturally stylish in tailored trousers and short-cut jackets. We chatted, half in English, half in Italian. THE LADIES – showed me the half dozen wines the estate produces and they began to explain the story behind the wines. It started almost seven hundred years ago when vines were first planted on these slopes. There are about 8 hectares of vineyards stretching down from the house to the banks of the River Brenta. The land is fertile and rich in alluvium. Crops grow well here and the water supply, straight from the Alps, is abundant. I should explain that Villa Angarano is located just a few kilometres west of the River Brenta and just west of the town of Bassano del Grappa. It was designated part of the UNESCO World Heritage site ‘Palladian Villas of the Veneto’ in 1996. Both Carla and Giovanna are proud to be ambassadors for UNESCO in this part of Northern Italy. ‘We are UNESCO’s representatives in Bassano’ they told me. THE JOURNEY really began for the sisters in around 2001. They employed an enologo (a wine maker and wine expert) to examine their land and review the local terrain (‘terroir’ as the French call it). The challenge was to identify the very best grape varieties for the environment and the soil at Villa Angarano. Replanting began in 2003 with Merlot and Cabernet grapes. Later Chardonnay and Vespaiolo were planted. Vespaiolo is unique to this part of Italy, a dry, fruity, white wine that is produced only in a small area west of the River Brenta. The goal was to work in harmony with the land to produce the best quality wines possible. This philosophy combined with hard work, focus and passion is beginning to pay off. Angarano wines have won several prizes in recent months. I ask the ladies how they feel about the challenges they face. Inheritance of a palladian villa and it’s surrounding land brings huge responsibility. They are both dedicated to maintaining, running and improving the estate. GIOVANNA, CARLA and ILARIA are committed to producing high quality wines and distributing those wines far and wide. They are keen to start exporting their wines to new markets and maybe to the British Isles. Giovanna travels constantly between Bassano and Milan, tirelessly promoting the Angarano wines. Meanwhile at home the ladies have renovated the old stable building, the barchessa, which is now available for meetings and events. The timber stalls and the names of the horses painted on the walls still remain. Beyond the stables is the family chapel, last used for a family wedding some years ago. It is important to remember that, above all else, Villa Angarano is a family home. It is not open to the public, there is no farm shop or tea room. The sister’s mother La Contessa spends her summers at the house and is typically in residence from June until September. 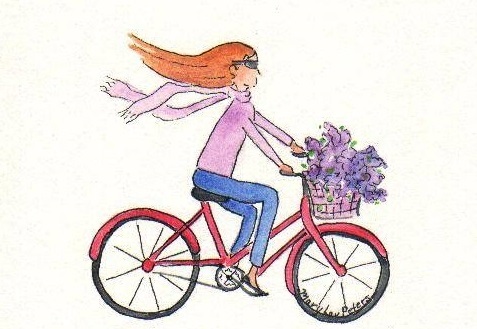 It reminds me of one of Jane Austen’s dowager duchess characters moving to the country estate for the summer. Charming and bucolic. The colonnaded loggia spans the south side of the house and extends down the west and east wings, here there are comfortable chairs and sofas. I can picture the family here, chatting and laughing on a warm July evening. IN 1987 VILLA ANGARANO received a visit from our very own Queen Mother. The visit caused considerable consternation with the Bianchi Michiel family. Protocol instructions were sent in advance, including a request that a drink should be available for the QM. The Italians generally, despite their wine production, drink very little. They couldn’t believe the strength of the gin and tonic prepared for ‘Her Majesty’, whom I happen to recall had a penchant for gin and horse racing! A request to see the kitchen caused even greater panic amongst the hostesses. Although, after a small amount of organisation, a tour of the kitchen was made possible! I’m impressed and charmed by Carla and Giovanna. The responsibility and obligation that they feel to this country estate is tangible, real, emotional. They are the stewards of a part of the Veneto’s history. It is their duty to pass it on in tact to future generations. It seems to me that the ladies demonstrate the same fortitude that the citizens of Bassano have done over the years.In World War I the strategic location of Bassano and it’s bridge across the river was the scene of some terrible battles. The famous Alpini Regiments were based here and Monte Grappa was the site of fierce and prolonged fighting. I think fortitude and strength of character is in the blood here – certainly the Bianchi Michiel sisters are strong, generous and kind. Determination too is here in abundance. CONGRATULATIONS & COMPLIMENTI to Carla and Giovanna on what they have acheived so far – I’m sure more great things are still to come! Each time I visit I’m even more impressed with the wines. Greetings and warm wishes to you all!! Villa Angarano is mentioned in I Quattro Libri dell’Architettura, a very important book by Andrea Palladio (1570). Four Books of Architecture. Published Venezia, 1570. Villa Angarano as it stands is only partly by Palladio, in 1996 UNESCO included it World Heritage Site “City of Vicenza and the Palladian Villas of the Veneto“. 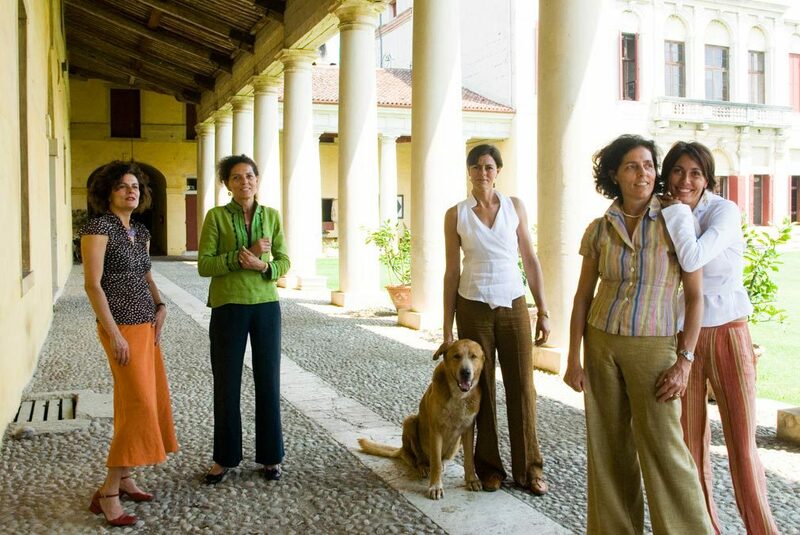 Next time you are in the Veneto, just north of Venice, think of Villa Angarano and the fabulous Bianchi Michiel sisters. Buona Fortuna a tutti!! What an inspiring post! Thank you, Janet. I’d love to meet these women. Please congratulate Sue on the photos! I really enjoyed your post, it provides many details I ignored (since I visited the place during an event there was no time for a long chat). And I have to admit that… I evny your prose! As Italian who tries to write in English (without proper knowledge) I feel really miserable now; my posts must seem written by a 9 years old kid 🙂 Anyway, I’m happy you found me! Laura I love the subjects that you choose and I adore the places that you write about. I love Padova, The Palladian Villas, Asolo, Bassano. I am so happy to find a ‘kindred spirit’. Thank you!!! I am very happy to be in contact with you – I love the photos you post! Especially Lago di Braies. Now I want to go there! This is so inspiring! It’s such an undertaking, maintaining a vast estate, getting it to provide an income. Do all five sisters live there with their families? Also, what did the kitchen look like? Fascinating, Janet–are you singing in the chapel? Hi Mary Lou – I think I was expressing myself vigorously!!! Reading this for the second time (after traveling to Sicily with you) I’m struck by three things: your knowledge thru intensive research, your ability to express to your readers just why this is important, and for the sisters, the fact that it’s a combination of passion, focus, and hard work that has made their villa/vineyard successful. Well done, Janet! It was really easy to write this piece because the sisters were so passionate about their work. Also the responsibility that comes with inheriting an estate like this is just enormous. And my third reading has impressed me just as much as the first and second readings! I’m there with you listening to the animated sisters, walking through the beautiful courtyards, and getting the background on this region’s rich history. Thank you, Janet! Fascinating account Janet! Many Italian families are so wonderfully proud of their heritage – lessons to be learned all round! Yes Katharine – I totally agree!